As a universal language, music is the one thing that everyone can enjoy. As such, different cultures have unique musical stylings and instruments. 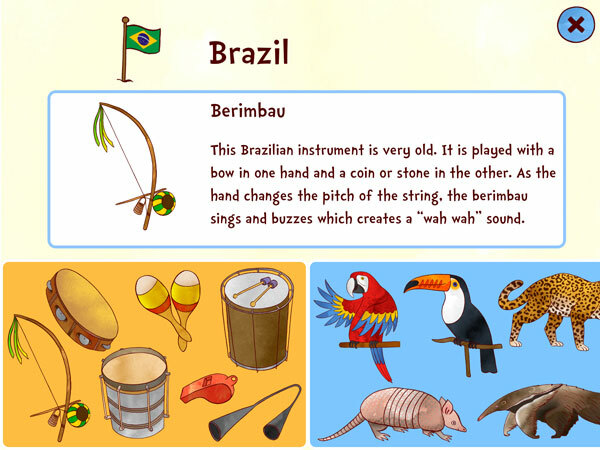 In the app Jazzy World Tour, kids can learn about these interesting instruments as well as the countries they originate from. Accompanied by the app’s adorable mascots the Jazzy kittens, you travel the world in a hot air balloon to explore the unique music and cultures of various countries. Upon opening the app, you will see a world map marked with several country flags: US, Brazil, Spain, Egypt, Kenya, India, and Australia. After tapping on a flag to visit a country, you can choose to learn, play, or create. The Learn section is where you can read up interesting facts about a country’s flag, musical instruments, animals, food, and other cultural highlights. For example, in Spain you can learn about the Spanish guitar, castanets, the Flamenco dance, matadors, and even a landmark called Park Guell. To learn about an item, simply tap on its picture groups at the bottom of the screen. The app will then bring up its fact sheet. It is interesting to know that you can also tap on the picture on the fact sheet to listen to fun sound effects. In Play, you can listen to musical samples of a country’s native musical instruments. Here, an adorable animal band dresses up in the country’s traditional clothing and waits with an instrument in hand (or should I say paws?). Tap on an animal musician to hear him play a quick tune. Finally, the Create section is a unique feature of the app that lets you create photos and videos using colorful and animated stickers based on the location and the things found in the country. You can then save your work to the Travel Book. The app lets you visit several countries around the world. Jazzy World Tour is a cute and educational app that invites juniors to explore the diverse music and cultures of the world. Designed for ages 3 to 8, the app presents a range of activities to balance between learning and playing. For the most part, narration is available to guide kids around the app. However, non-readers will need parents’ guidance in the Learn section as it does not provide voiceovers for the fact sheets. Parents should also know that the app does not contain in-app purchases or ads. It does, however, include a feature to share photos and videos from the Travel Book to social media (Facebook and Twitter) and links to the developer’s website. I have always supported the idea of getting kids to learn more about the world from an early age, so naturally Jazzy World Tour is an interesting app for me. 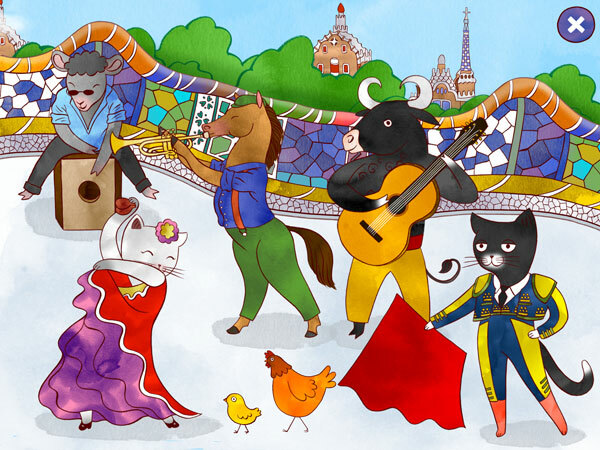 I like that it explores music and more importantly world culture, which is a topic that I do not see often in the market of children’s apps. The educational aspect is certainly there. The Learn section, for example, is thoughtfully designed to include at least ten items for each country. The fact sheets are also nicely written; they are short (around 50 words each) yet fascinating, and even I learned a thing or two from the app. In terms of presentation the app does a great job; I like the vivid and interactive illustrations. Like with the developer’s other app Jazzy ABC, the virtual instruments produce high quality musical samples when tapped. My only problem with the app is that the record video feature in Create is terribly buggy on my iPad third generation. The recording stutters, and I encountered several crashes even before the recording begins. It is fortunate that the rest of the app works well, but I do hope this problem gets fixed soon. Jazzy World Tour is a great musical app that invites juniors to travel the world and learn about different music and cultures. Other than interesting fact sheets, the app also has an interactive virtual band that lets you hear high quality musical samples. Even with the video recording bug, I still think the app is worth recommending for its educational value. Note: If you are interested in purchasing Jazzy World Tour, please note that the video feature is not available on the iPad first generation. Jazzy ABC. Cute cats help you master your knowledge of the ABCs and musical instruments. Flora’s Forest. Join Flora as she explores the enchanted musical forest in search of a lost kite. It's a small world. A colorful musical app based on the famous Disney Parks attraction.